Permanent wiimote sync: HOW TO DO IT! There have been a lot of activity regarding the permanent synchronization between a Windows PC and a wiimote. I made some test, and finally found a working solution!!! to get the source files and binaries for a Windows XP PC. The code is able to permanently pair a wiimote and a PC. After a registration you only need to press "1-2" on the wiimote to reestablish the connection. It even stays connectable even after a PC shutdown/restart. The code is still in demo phase, specifically I just encountered a problem, when there are more BT radio in close vicinity of the wiimote. And if anyone know how to check for an established connection (like the one you see in the BT device list gui: "Connection established") programatically, then I am all ears!! Copyright © 2008 MergeIt, Aps. License GPLv3+: GNU GPL version 3 or later <http:\/\/gnu.org/licenses/gpl.html>. and this permission notice appear in supporting documentation. encompass permanent pairing of a wiimote and a Windows PC. use unregister to remove the pairing. Be sure to unregister all wiimotes, before doing a fresh paring. connection more robust: replace the line "allowed_wiimote_adr=00:00:00:00:00:00"
with your specific address, like "allowed_wiimote_adr=00:22:D7:94:13:2B". 1: Hard-syncing the wiimote, to get it to know the PC bluetooth address. 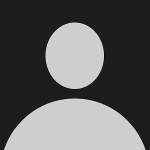 form ":00:" is also only (and always) encountered in the end of the address. of the confusion regarding "reversing the MAC address byte order"). by looking into the Bluetooth device properties. 5: And, voila...from here you can run all the Whiteboard software. wiimote power button for a couple of second) and soft-resync, that is a "1-2"
problem. This problem may be attributed to the BT caching mechanism in Windows. Do not hard-sync the wiimote after a successful pairing. wiimote with a new computer. each other. They pair individual to their respective wiimote, as expected. PC and wiimote only (not tested). another, secondary BT adapter is switch on. The problem needs to be futher investegated. pairing, if you experience problems. Bluetooth radio compatible with the wii-remote. Microsoft BT stack, driver ?? Not tested: multiple simultaneous wiimote connections to the same computer. Re: Permanent wiimote sync: HOW TO DO IT! Well, the trees does not grow into heaven: I encountered a problem regarding my solution in the previous post. One some PC's the pairing seems to be successful, but it is not persistent. 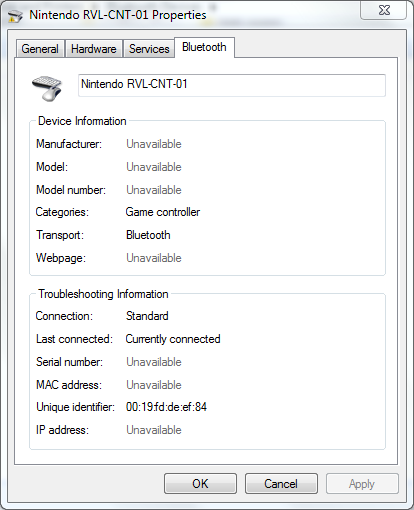 This means that the PC and wiimote looses connection abilities again. The reason for this behavior may be found in the Microsoft BT API, and I am currently investigating the issue. This also means, that the demo software may or may-not be able to create a permanent connection....please post you result here, if you try it out! The joys of software development, this app looks fantastic, look forard to testing this w/end. I get the message using the demo that the sync was successful but it's not a permanent connection. I'm using the Microsoft Wireless Transceiver for Bluetooth 2.0 with the default Microsoft bluetooth stack. The computer is using Windows XP SP3. I'd like to get it working so if there is any further debug information that could be provided let me know. Reliable permanent sync would be a BIG step forward for the project ! Keep up the good work. Very nice work Mr. Frigaard. Would it be possible to also emulate how the Wii is turned on and off to turn the Wiimote and the connection on and off quickly? That is both the binary, a sample version of Wiimote Whiteboard that WiiScanTray works with, and the source itself, if someone needs it. Maybe someone else can figure out what's going on, since it does seem to authenticate, but not reconnect when needed. 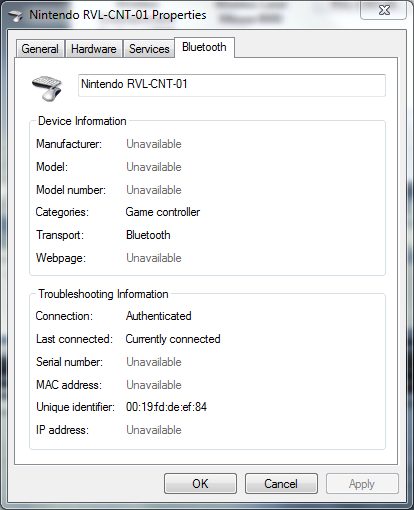 One thing you need to note is the wiiscan.ini file, where the MAC address of the intended wiimote is. The current filter should match your wiimote, but might not. While it works after after the initial connection, once it disconnects, it never becomes reconnected again, though it continues to show it as "Authenticated." I'm not a developer, so I'm not really sure what it means, but I'm guessing there is more to creating a permanent connection then just authenticating it, so even with authentication(which this does seem to provide) you'd still need some kind of auto-connect feature. That's just a guess though, hopefully someone with an SDK can actually look at the nitty gritty and shed some light.